New recruitments are carried out in March and September every year. The training starts at May and November each year. 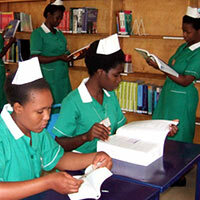 To apply at the nursing school candidates have to meet the minimum entry requests of Ministry of Education and Sports. This includes passes in English Language, maths, biology, chemistry, physics at O-Level. The applicant should not be out of school for more than 3 years. As part of the application program candidates are subjected to both written and oral interviews. each student is required to participate in co-curricular activities including netball, football, basketball etc. The school has 3 class rooms, computer lab, library, skills lab, 4 dormitories, dining Hall, recreation hall and a stand by generator.